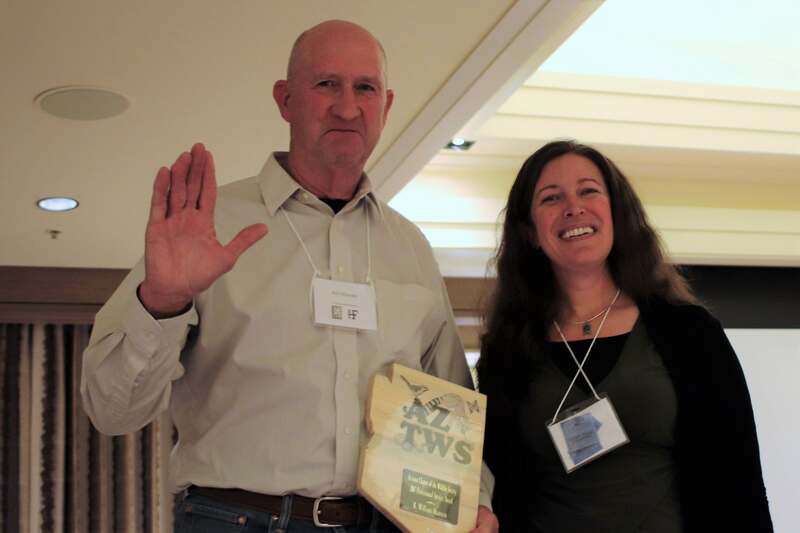 This year marked the 51st Joint Annual Meeting of the Arizona and New Mexico Wildlife and Fisheries Societies, hosted in Flagstaff, AZ. We encourage our members to nominate deserving people or organizations for these annual awards, and as has been the case in the past, our chapter was privileged this year to receive numerous nominations for well-deserving individuals working in the wildlife management field. Below are summaries of each award, awardee, and the outstanding achievements for which they were nominated. David Patton, J.D. Greenberg, Haley Nelson, Bill Mannan, Erin Zylstra, Colin Beach, and Chad Loberger. Carol Chambers accepts the award on David Patton’s behalf. The David E. Brown Lifetime Achievement Award recognizes an individual for his or her accomplishments in wildlife biology and management over their lifetime. David Patton is the second recipient of this award. Dr. Patton’s legacy of leadership and accomplishments in the field of wildlife management are truly outstanding and deserving of recognition. He is an individual who always leaves organizations stronger when he leaves than when he arrived. In addition, his history of mentoring younger students, scientists, and managers is exemplary. David has been a member of The Wildlife Society (TWS) since 1959 when he was an undergraduate student and went on to become a TWS Certified Wildlife Biologist. David’s professional career began in the Southwest in 1963, when he and two others were hired as the first wildlife biologists in the Southwestern Region of the Forest Service. He was stationed on the Santa Fe National Forest in New Mexico, where he worked for about a year and a half. His next move was to Tempe, Arizona, where he completed a 22-year career as a wildlife biologist and Project Leader at the U.S. Forest Service Rocky Mountain Research Station. After his retirement from the Research Station, he took a position at Northern Arizona University as the first professor of wildlife in the School of Forestry. He eventually was appointed Dean of the School of Forestry. 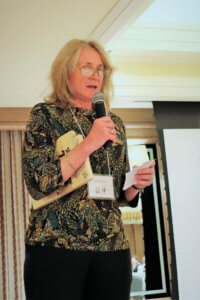 Once again “retiring” in 1999, Dr. Patton took a job as Director of the Center for Wildlife Management in Kenya, and later as Director of the Center for Rainforest Studies in Australia. In 2003, he was asked to come back to NAU, where he served for a period of time as the Interim Dean of the School of Forestry during a transitional period of reorganization at the university. 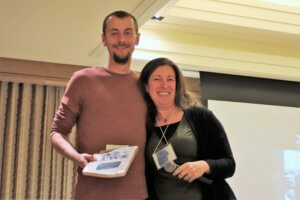 Scott Sprague accepts the award on J.D. Greenberg’s behalf. The Conservation Award is given to a person, or persons, not employed directly as a wildlife biologist, or an organization not directly involved in wildlife management who contribute significantly to the conservation of wildlife and/or their habitat in Arizona. Conservation can include, but is not limited to research, education, legislation, and protection or enhancement of wildlife and their habitat. J.D. Greenberg is not a professional biologist nor a paid environmental advocate. She is a citizen of Yavapai County who is always present to speak on behalf of wildlife threatened by development. She is a voice for bringing together diverse stakeholders to make informed decisions that can balance the needs of development with those of natural resources. J.D.’s efforts led to the creation of Yavapai County’s Ecosystem Connectivity and Mitigation Advisory Committee, which will study and advocate for ecosystem connectivity in land use planning and transportation projects. We are pleased to recognize and thank J.D. for her efforts through this award. This year, we had a tie and the award was given to two deserving individuals. Thanks to Chad and Colin’s tireless efforts, wildlife populations across the Southwest stand a better chance of survival into the future, and we are honored to recognize both of them with this award. Chad Loberger is one of the core pillars of the Arizona Game and Fish Department’s road ecology program. His contributions have helped the program become and remain an international leader in the mitigation of habitat fragmentation. Chad has been the boots-on-the-ground for numerous efforts, including the flagship U.S. Hwy 93 desert bighorn sheep project. He has also served as liaison with agency personnel from Utah, Nevada, and New Mexico for ongoing AGFD road projects in those states. Colin Beach leads field operations for other projects in the Arizona Game and Fish Department’s road ecology program, including the SR77 and MSP mule deer connectivity studies. Colin has designed and implemented tools that improve data collection accuracy and efficiency. In addition to those process improvements, the product of his recent Master’s degree is a step toward enabling the use of wildlife movement data to quantitatively derive where wildlife movement barriers may occur. This will help direct millions of dollars and thousands of hours of labor to areas where they will have the greatest benefit. 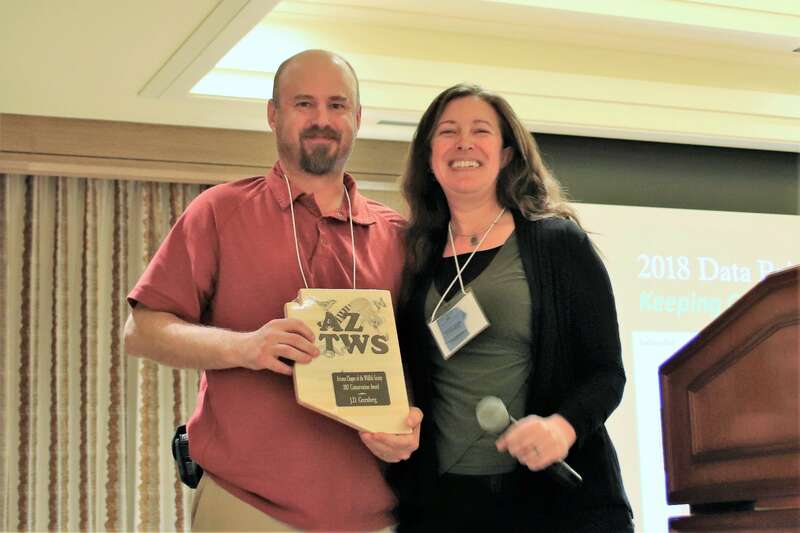 The Doug Morrison Award is given in memory of Doug Morrison to an Arizona Biologist in a non-supervisory position who has made significant contributions to the management and conservation of wildlife in Arizona. This Award exemplifies the dedicated work ethic of the Chapter’s former President and U.S. Forest Service Biologist, Doug Morrison. Contributions are in areas of wildlife research, education, and training, management, or law enforcement. Technological advances have untapped potential for the field of wildlife management. People with a solid wildlife foundation and a mastery over these new technologies will lead us into the future. Haley Nelson is one such person. As an example of this, last fall, Haley built a full suite of digital tools to improve the safety and efficiency of large-scale ungulate captures. Her integrated toolset allowed for real-time tracking of aircraft, capture support teams, animal observations, and collar deployments. These improvements helped to minimize both the cost and safety risks associated with extended helicopter operations. Haley’s work has the potential to radically influence many of the processes and procedures all of us in the room will follow over the next decade and beyond. The Professional Service Award is given to an Arizona biologist for outstanding contributions to management and conservation of wildlife. This individual is also recognized for their professional work standards and conduct. Contributions are in the areas of wildlife research, education, and training, management, conservation, or law enforcement. Dr. Mannan is a talented educator and accomplished researcher. He began teaching at the University of Arizona in 1982 and, ever since, has contributed to the wildlife profession through university-level education, avian research, and administrative leadership. He is an accomplished author, co-authoring the wildlife-habitat relationships textbook and publishing more than 60 peer-reviewed publications. He has long been involved with TWS, serving on the board of the AZ Chapter and as faculty advisor for the UofA student chapter. Bill has previously received three AZTWS awards– WILDHARE (2002 and 2006) and Scrapping Bear Award (2005). However, his contributions to and sustained nature of efforts for our profession – as well as his announcement of his impending retirement – make him eminently qualified for another. We are pleased to bestow him with one more recognition. 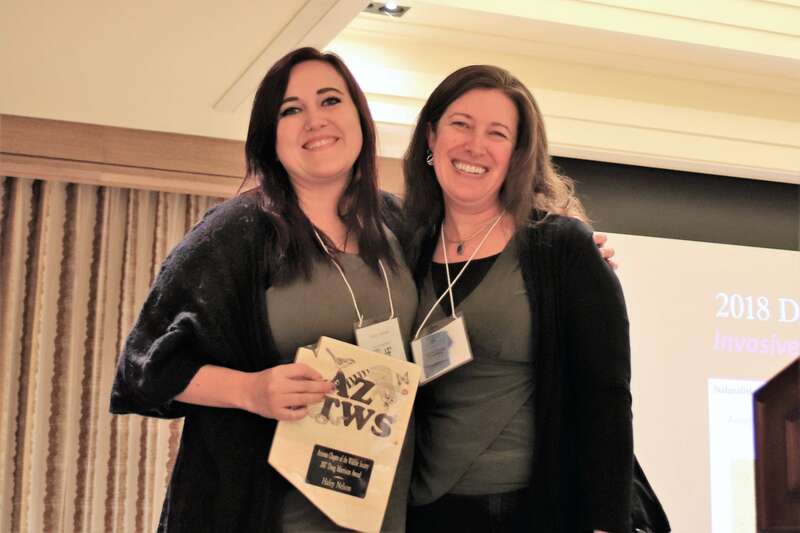 The Roger Hungerford Award is given to a student who, while attending an Arizona college or university, made significant contributions to the management and conservation of Arizona’s wildlife and/or habitat. Contributions are in the areas of wildlife research, education and training, management, conservation, or law enforcement. The Award is given in memory of one of Arizona’s finest research biologists, Roger Hungerford. Erin Zylstra has more than a decade of experience studying and working with wildlife in Arizona. She is already an accomplished scholar, having published six papers in top peer-reviewed journals, with two additional papers in review – a strong record for a PhD student. She is an accomplished speaker and has received Outstanding Student Paper at three different scientific conferences. She also has a remarkable aptitude for quantitative methods and is a go-to person for fellow students as well as professors. 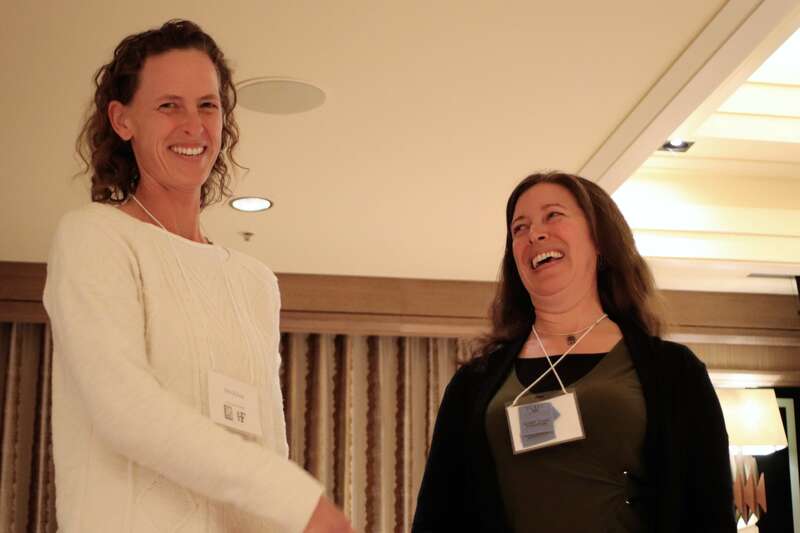 Erin’s intellect, creative perspective, and a combination of practical skills, life experiences, and innate drive made her the perfect recipient for this award.